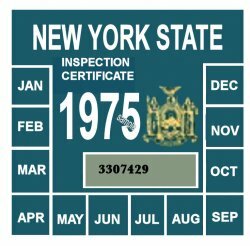 1975 New York INSPECTION Sticker - $20.00 : Bob Hoyts Classic Inspection Stickers, Add a Final Touch to your Restoration! This beautiful 1975 NY INSPECTION sticker has been painstkingly reproduced both front and back directly from an original. NOTE: If you want your car to be historically correct, you will need the 1975 Registartion sticker to go with the inspection sticker. See our 1975 NY REGISTRATION site. New York did not issue dated license plates in 1975 and required a registration sticker also to be attached to the windshield with the inspection sticker. Many thanks to my good friend, Ed Keyes, Phoenix AZ, who slowed down from 100 mph to 80mph in the Arizona desert freeway, so I could hang out his window and snap a photo of this original on a 1960 Falcon being hauled on a trailer.